I’ve always loved beads shaped like leaves, which is part of my botanic obsession. The flowers themselves I find a bit fussy, but I can’t buy enough leaves. In Mexico, I found leaf beads that were olive on one side and lime on the other, curved, and a kind of plastic that could pass for wood. I made them up into a three-tier necklace, using lime glass beads from India. People always rave about this necklace, so I made another one and sold it to an old classmate at my high school reunion. That’s when Pam ordered hers in blue. The blue leaves were a little hard to find, and they mostly came in sets with other leaves. 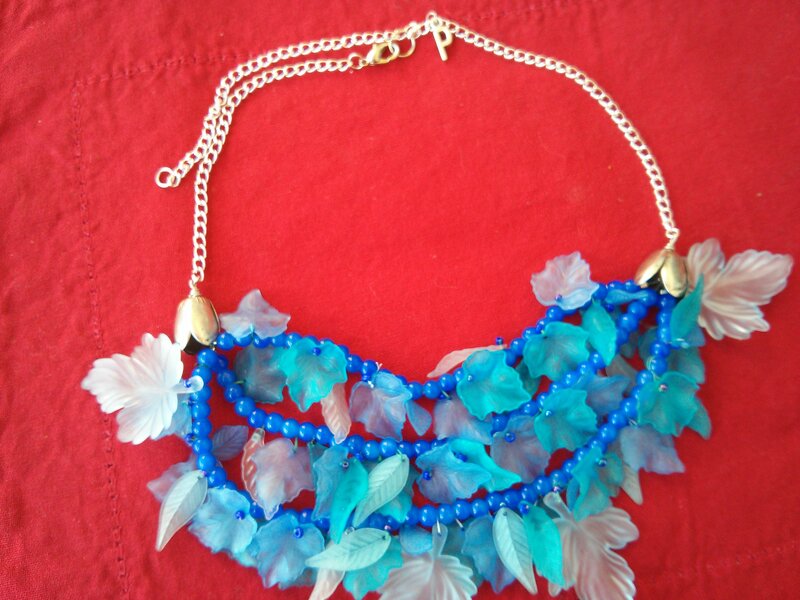 (If anybody wants this necklace in yellow, pink, and orange, I’ve got a LOT of those leaves left.) The newer versions of Leafy Green have a chain in lieu of a long strand of beads. It’s much more modern and lightweight. While making things for friends, I whipped up a hostess present for my friend Marcia who lives on the sea in Rhode Island. 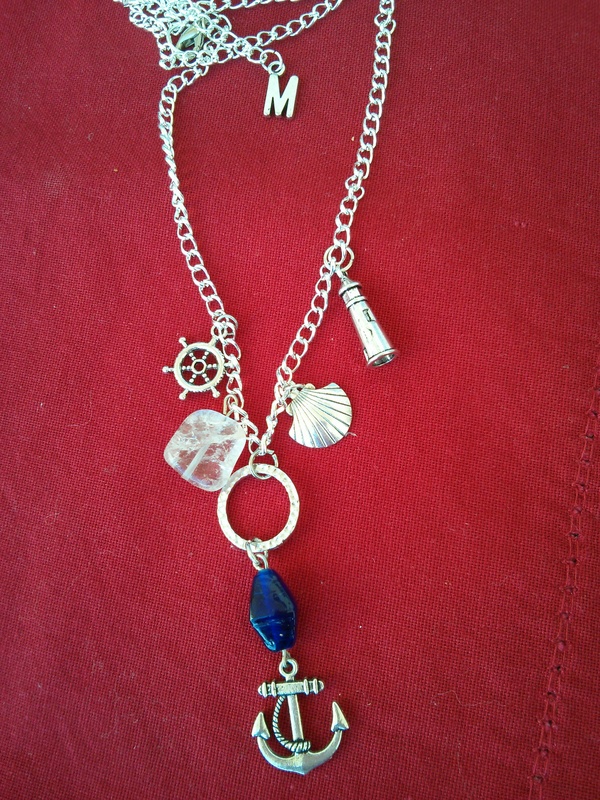 It has five charms: an anchor, which is the state symbol, a lighthouse, a quartz rock, a ship’s wheel, and a seashell. They’re on a long silver chain, as Marcia is petite and benefits from a vertical line. As with all the custom necklaces, this one has her initial near the clasp. She loved it and did me the honor of wearing it right away. Charms are making a big comeback, and are available in all kinds of shapes and symbols. A custom necklace is a not-so-pricey way of making a unique gift. At the moment, I’m thinking up ways to use the fun charms I found in Paris: each a dinner plate with a knife, fork, and spoon across it, like a satisfying and finished meal. No, no food scraps. The necklace is fantastic and though it did not go with the outfit I worn when I received it, I assembled the ensemble I wore the next day to work around it. The comments were outstanding. Thanks dear friend. Thank you, Pam, for supporting local artisans and then writing about it!